Note: this page is a slightly modified copy of the item description from the eBay auction where this clock was sold. It will remain indefinitely, as an example of my work, and as a reference for the clock's owner. This is the first in a series of unique digital clocks based on unusual and forgotten techniques for displaying numeric data. Information on other clocks as they are developed, and a link to sign up to be informed whenever one is offered here on eBay, can be found here. This clock is based on one of the earliest electronic numeric display technologies, in which each digit is represented by a column of ten labelled lights, one of which is lit at any given time. It's hard to give an exact chronology for this particular technology, since there doesn't seem to be a single recognized name for it, but it seems to have been most popular in the early 1950s, and was quickly replaced with Nixie tubes when they were introduced. However, this technology lingered in use for at least 20 years, perhaps due to its relatively low cost: the piece of electronic lab equipment I adapted to make this clock, a Thornton Associates DEC-101 Decade Counter, was built in 1972. To the right is a close-up of the rightmost three digits of the clock, showing a time of 20 minutes and 37 seconds past the hour. Since the device only has a five-digit display, I combine the tens and ones of seconds into a single column. The clock is about 8" wide, 4" high, and 3.5" deep. The enclosure is brushed, extruded aluminum, with black aluminum end plates. It is designed to sit on a shelf or desktop, there is no provision for hanging it on the wall. The power cord is 5 feet long, and requires a 3-prong outlet. The controls and connectors on the front have been left with their original labelling, so it isn't immediately obvious that this is a clock at all. The clock has a backup capacitor which will maintain timekeeping (at some loss in accuracy) for 10 to 30 minutes, in case of power failure or simply moving the clock to a different outlet. The clock's datekeeping ability is Y2K compliant, and is valid through the year 9999. Here's a crude mockup of what the clock actually looks like in operation. The time initially shown here is either 10:37:25 or 10:37:52 - the two possibilities can't be distinguished in a still picture, but it's easy enough to read the seconds when they are changing. The time is PM, indicated by the '9' in the upper left corner. On the actual clock, 12 or 24 hour format is selected via a switch on the right side. This is done by pressing either of the pushbuttons on the front of the clock. A time setting mode, which looks just like the normal display of time, date, or year except that one of the time elements will be flashing. The left button steps through the various elements which can be set, the right button increases the flashing element. 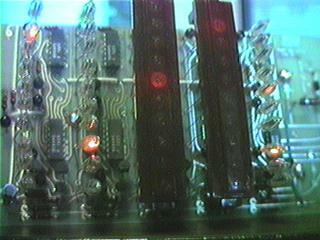 A test mode, in which all of the lights turn on sequentially at a rate which can be adjusted via the buttons. This is intended for identifying dead or dying light bulbs. 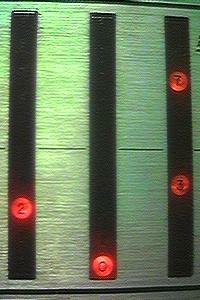 A demo mode, in which one light in each column bounces up and down at varying speeds. This one's just for fun, use it as a prop in your next sci-fi movie! Here are the back and side labels of the clock in Acrobat PDF format, so that they can be printed out at full quality if they ever need to be replaced. 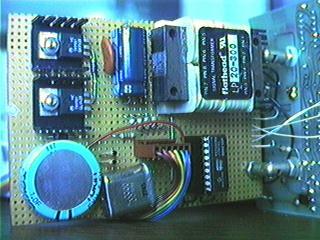 Here's the main circuit board of the clock, showing the five columns of NE-2 neon light bulbs. 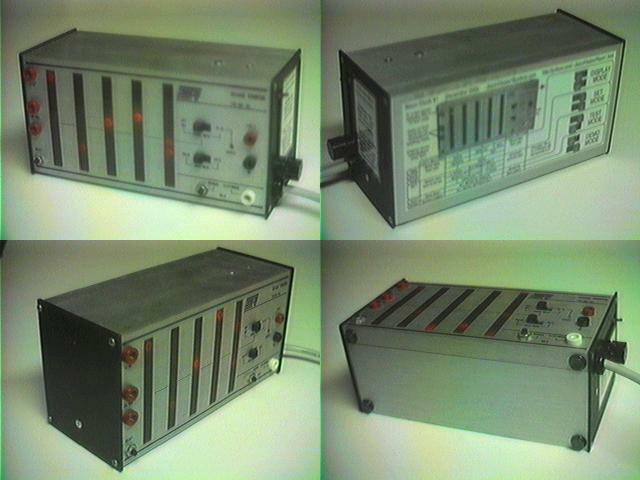 It is largely unchanged from its original 1972 form, the early DTL integrated circuits still do their job just fine. The only significant modification I made allowed individual columns to be blanked, a capability not needed in the original device. Here's the relatively small amount of circuitry I added to turn this decade counter into a clock. It's basically a power supply (the original device used a separate power supply module which I don't have), and a Microchip PIC16C54 microcontroller to run things. - there are some concerns about this clock that you need to be aware of. The clock is designed to run on 120 volts, 60 Hertz AC power. This limits its use to basically just the USA and Canada. Travel adaptors designed to allow the use of electrical devices in other countries will not work - they can change the voltage easily enough, but can do nothing about differences in power line frequency (which is the basis for the clock's timekeeping). The original device is close to 30 years old, and in that time has accumulated its share of scratches, marks, unremovable sticker residue, etc. I've added a few scratches of my own in the process of adapting it as a clock. None of these are all that severe, but be aware that this isn't an item in perfect condition. The clock's electronics run somewhat hotter than I'd like. It's been running continuously for about 7 months with no problems, so I don't think it's in any danger of overheating itself, but it would be a good idea to keep it away from other heat sources - don't put it in direct sunlight, or on top of a monitor or TV set. You wouldn't want to put it on a monitor or TV anyway, as the clock puts out some magnetic interference which would cause any screen within about a foot to jiggle. Neon light bulbs (as used in this clock) have a very long lifespan, but they are eventually going to die, and will be a pain to change - they're soldered in place, and it's tricky to get them all simultaneously back into their slots in the front of the clock. The buyer will get 20 replacement bulbs (in a plastic bag inside the clock, so they can't get lost), and more are easily obtainable. I would be glad to do bulb replacements at the cost of my time, materials, and shipping, if the buyer doesn't want to deal with it themself. Any questions or comments about this page can be directed to Jason Harper. I'd also appreciate hearing about any significant events involving this clock - used as a movie prop, sold at auction for a million dollars, etc.